Choose the doll that is to become a mermaid. Measure her length from waist to end of her feet. My daughter’s is 8.5 inches. Also measure her waist around (mine was 9.5 inches). I will ignore the fact that my daughter’s favourite doll is permanently wearing a tuque and scarf and it isn’t very mermaid-like, since she won’t really care, either. 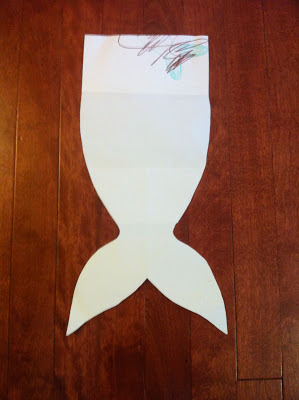 Draw a pattern on a sheet of paper that resembles a tail. 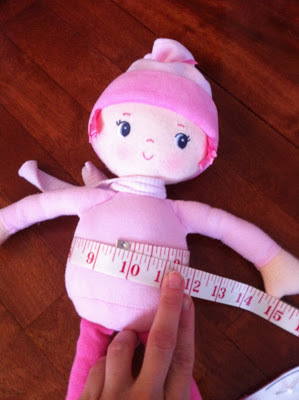 Make sure that your tail will accommodate the measurements of your doll. 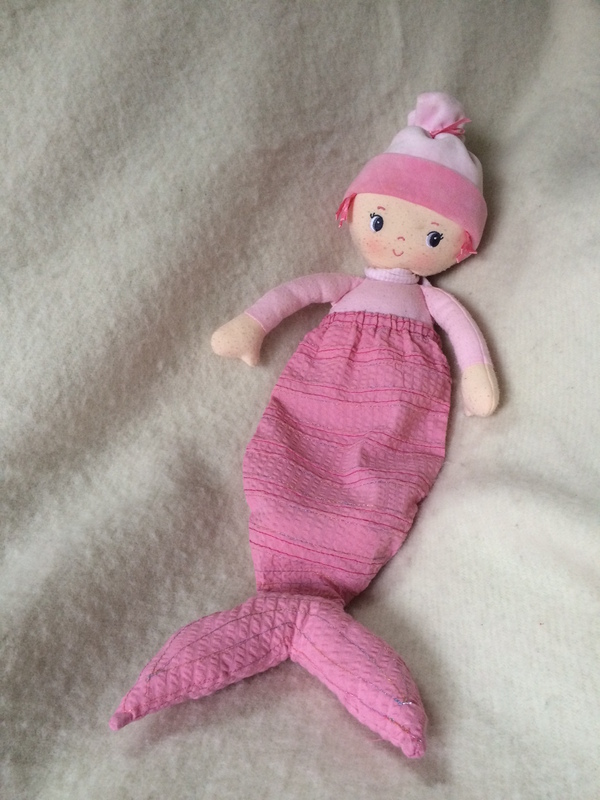 Don’t plan on putting the doll’s feet in the tail fins it will be too difficult for your child to do on their own. 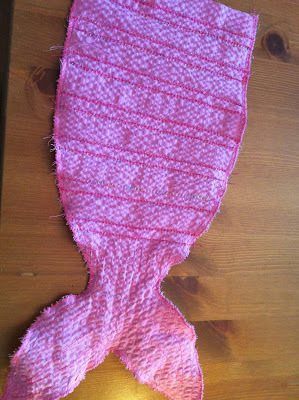 In my case the pattern measurement from waist to above the tail fin was about 10.5 inches long, and 7 inches wide. 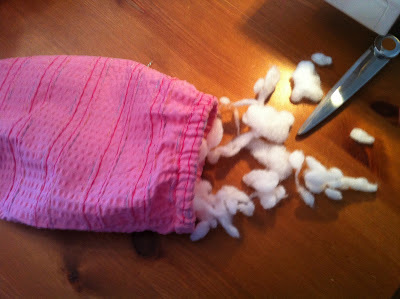 The extra length allowed for some fold over fabric on the waistband for the elastic. 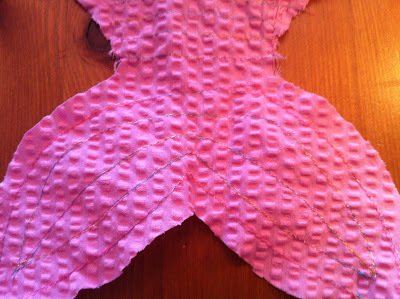 Lay your pattern on your fabric (with the grain) pin it, and cut two layers of fabric. I chose seersucker to give the tail some texture, but I can see it looking nice with some paisley or snake/animal print, anything really. 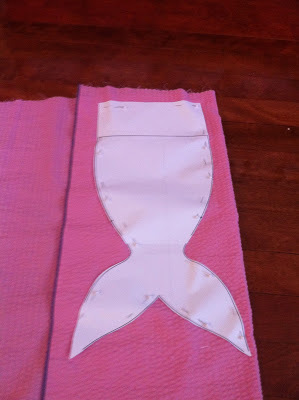 Embellish the front fabric (and back if you like) of your tail. This step could be optional depending own your taste or the type of fabric you have chosen. I could see it with sparkly fabric or hand sewn sequin elastic as an add on. For me, I have been dying to try out a new double needle that I bought and I figured that this was as good of a time as any. 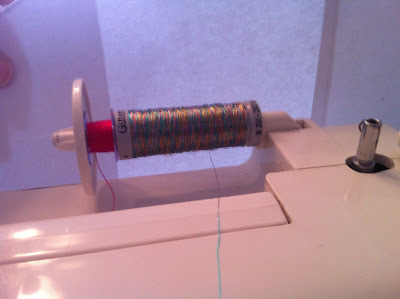 I purchased a pastel coloured metallic thread and a bright pink thread. 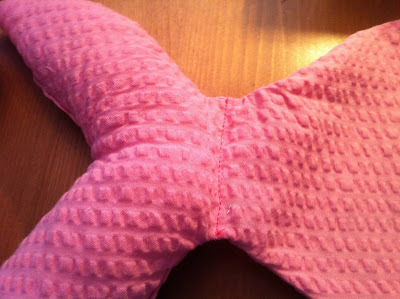 I threaded them both through the needle and started to sew the detail along the tail. Closer to the bottom, as the tail narrowed, I changed back to a single needle and freehand sewed some detail on her tail. Once the details are completed, pin your two layers of tail together, right sides facing, and sew them together with a 1/4 inch seam allowance. 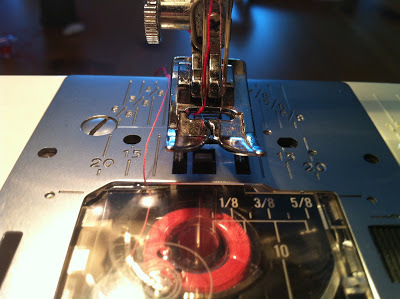 I zig zagged the seam edges to eliminate any fraying. 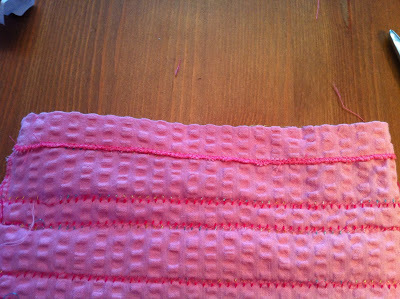 Finish the edges of the waistband fabric with a small, tight stitched zig zag stitch. 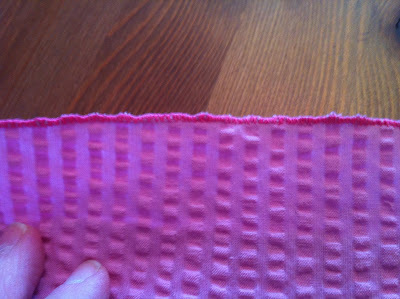 Fold the fabric over 6/8 of an inch, iron, and pin it. Sew around leaving an opening to insert the elastic. 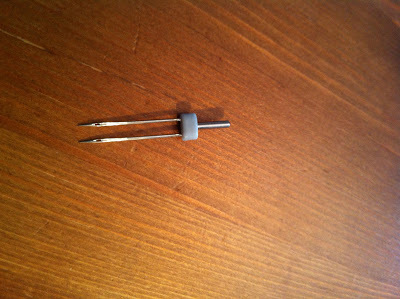 I used a narrow elastic about 1/2 inch wide. 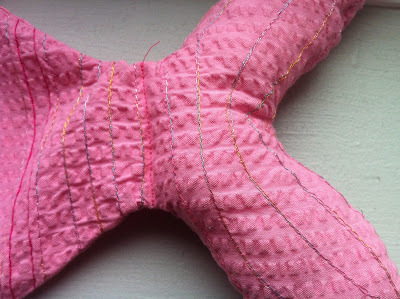 Insert the elastic and sew the opening closed. I used a 9.5 inch length of elastic, and sewed it overlapping an inch – in two places to give it some strength, as I anticipate some abuse from my daughter as she pulls it on and off. Turn your tail right side out, and iron it flat. Use a chopstick to poke out all the corners of the tail fin. Stuff the bottom of the tail, with the help of a chop stick, and sew the tail opening closed to keep the stuffing from falling out. Try it on your doll, and enjoy some playtime with your child. Hooray! ahh Mandia, thats brilliant. I wished I had a little girl. 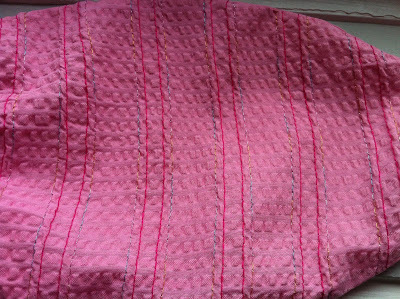 Hey…maybe I can make one for myself adult size to sleep in. 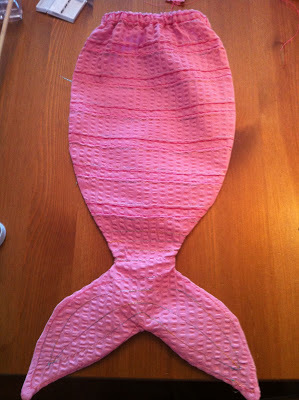 Hey..that gives me a whole new DIY idea based on this gem of yours: you could make these as sleeping bags for girls. 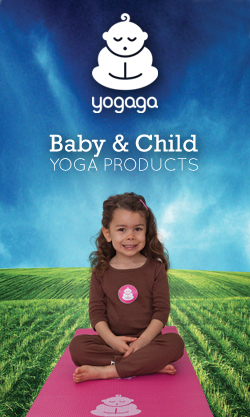 The full body ones for babies and toddlers. Call the brand Dreams of the Sea of something like that…. Too cute – looks like the idea is taken. Have you seen these? http://www.finfunmermaid.com/ I think I would drown! wow. and indeed..i would have some safety concerns. However, I do like the wetsuits with built in sharkfin. I could have some fun with that at the lake!